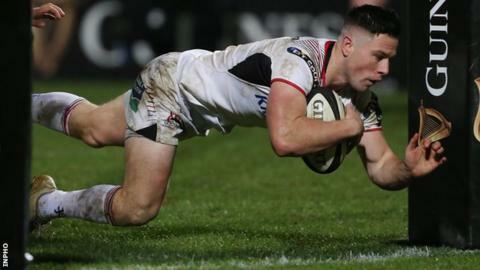 Ulster scrum-half John Cooney has signed a new contract extension which will keep him at Kingspan Stadium until at least 2022. The 28-year-old joined Ulster from Connacht last summer and has emerged as key player in the Pro14 team. "I've had an unbelievable time here and I'm delighted to commit my long-term future to the club," said Cooney. "The players, staff and supporters have all welcomed me with open arms and shown me incredible support." Cooney won his first international cap against Japan in June 2017 and added a second in this year's summer tour to Australia. He started his career at his home province, Leinster, before moving to Galway to link up with Connacht. Cooney scored 226 points in 25 appearances in a stand-out first season with Ulster and won three awards at the province's awards dinner in May. He brought that fine form into the new season and was the match-winner in last week's opening league fixture against Scarlets, kicking all of his side's points in a 15-13 win. He added: "The character that everyone within the organisation displayed last year, in challenging circumstances, was really impressive and I'm immensely proud to represent Ulster Rugby. "Bryn and Dan are creating a very ambitious young squad and I'm excited about what we can achieve as a group over the next few years, through a combination of hard work and talent."